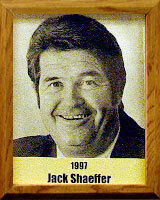 A native Tucsonan, Jack attended Mansfeld Junior High and Tucson Senior High. He was an award-winning sports photographer for the Arizona Daily Star. His outstanding career in photography started at Tucson High under the guidance of the late Harry Goldstein, graphic arts department teacher. After graduating in 1947, Jack received a scholarship to the prestigious Fred Archer School of Photography in Los Angeles. A University of Arizona football enthusiast, to say the least, Jack attended every game from 1955 to 1982, including all the road trips (paying his own way most of the time). Former Star sports editor Abe Channin once commented that Jack was so intent on getting a close shot of play in a UA-Utah game that both teams ran all over him on the sideline at the same time. Jack also coached basketball games for charity at Palo Verde High School and boxed for the Catholic Youth Organization, earning seven knockouts, mostly one-rounders.